Do you need D3.js in your workbook that interacts with the other sheets in the workbook? No issues. Want to re-define some part of the portal like what should happen when users want to export or see underlying data? It’s easy. Add excel export directly to the exporting options? It’s an hour of work. But how? This workbook contains a regular view and a ChartJS scatterplot view. When you click on any bars the scatterplot updates to show its underlying data using JS getData(). The magic is that we use an HTML object in our workbook that links to an HTML page published as web data connector. Web Data Connectors hosted on the Tableau Server, thus, they have the same domain as the portal and can access contents in their parent windows. 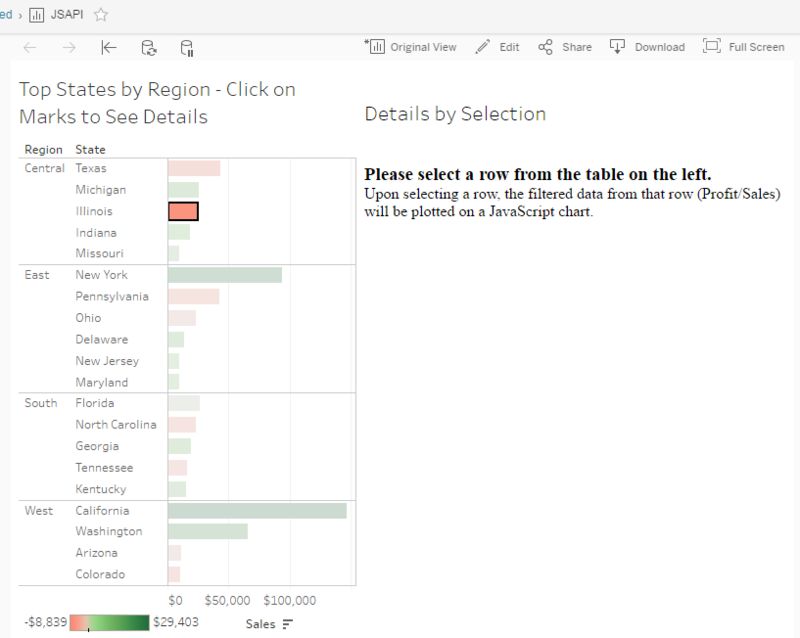 If you refer parent.parent.tableau.VizManager.getVizs() then you get instantly an already initialised Tableau JS viz object. Sounds easy and actually it is. Call tabadmin import_webdataconnector <html_file> on your server. Note the URL of the file on the server. Change the URL of Published HTML file parameter to the URL returned in step 2. Ask, if you have any. it should, could you post your error messages from the Chrome development tool’s console? My Bad! It works when i use the server with the ‘servername’. It is not working when its ‘Localhost’. I was trying whole the time till I posted the comment with Localhost. Does the same steps apply for 9.3 also ? This is great work Tamás and will open up lots of possiblities when it comes to dashboard creation. https://uploads.disquscdn.com/images/cd2fb0a6f779660eb671c22c6526e0610e3865faf2d720105fd3ce82812bfaa9.png Hi Tamas – I imported the html file as a web data connector and published the workbook to my local server. It shows the text from the WDC so it looks like it imported correctly (“Please select a row from the left…”) but I am not seeing any JS chart show up when I make selections. Any ideas? Thanks! Yes I changed the parameter in the workbook. 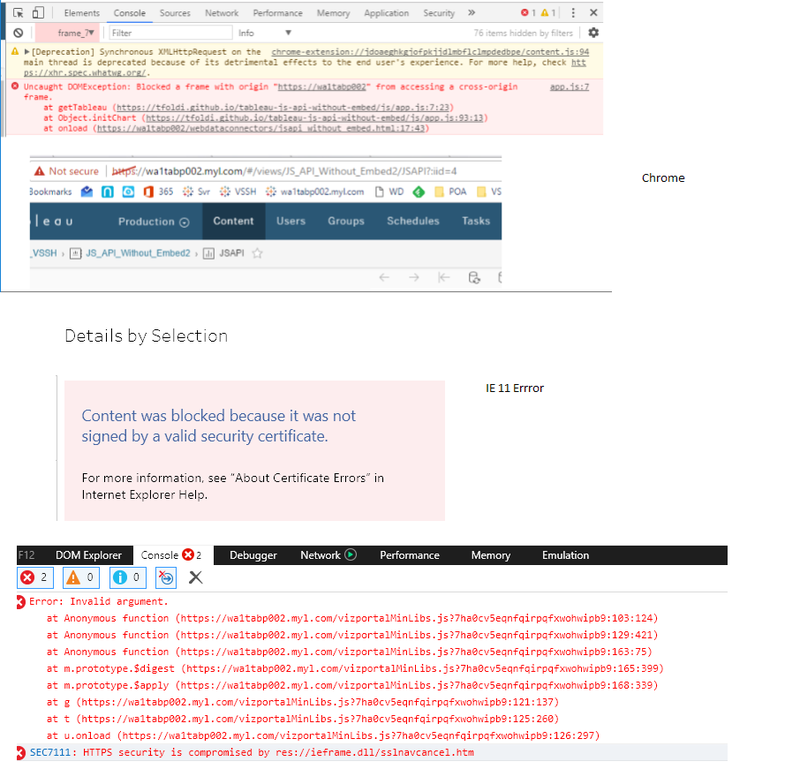 Looks like there are some cross-origin errors which are blocking access to your scripts https://uploads.disquscdn.com/images/92591ff4b1767f54641e435bf416c0f9ccb054bb258e82ee3edf74431821d97d.png . Maybe I need to change another tabadmin setting? Look strange as the web data connector’s origin is the same as frame origin. Are you available for a 5 mins screen share? Just to be sure: your tableau server host name is http://jebghardt-lap3/ – is that what you see in your browser’s address bar? Wow, thats silly. I swear I looked at that. I guess I just blindly took the value that tabadmin returned. thanks tamas!! Amazing stuff !!! The sample worked perfectly fine on my server setup. I was watching your another video on youtube where you showed REST API for Tableau Desktop (without using Tableau Server). I am really looking foward to that as in our use-case we want to share Tableau workbooks with end-users without publishing them to server. Could you please provide more details on that approach? it does not work for me, I need help, I downloaded the html file and that is not the same name you use here. Really this is good post. Initially I faced a trouble after downloading the html, and later on it worked for me.